Recommended to: Readers who enjoy feisty characters with lots of chemistry. If you lovely readers haven't noticed yet, I adore cowboys and romance. 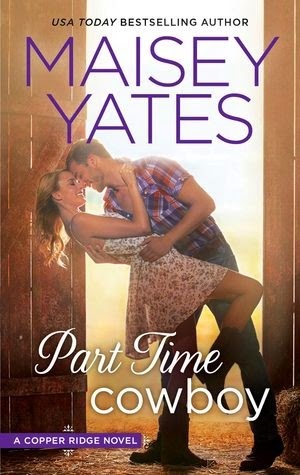 The combination is almost a guarantee to get me to read the book, but when I read the synopsis for Part Time Cowboy I knew it would be something great. I was not disappointed. If you enjoy hot chemistry between your characters, this is definitely the book for you. From the moment Sadie returns home to Copper Ridge she can't keep away from the hot sheriff- intentionally or not. While the insta-love isn't my favorite type of romance, I don't feel like this fits into that category perfectly. Insta-lust, absolutely, but the love took some work on both their parts and that's what made it great. Sadie's past has defined her since she left home and coming back was a chance to face her demons. Eli never left, as Copper Ridge is the only place he calls home, but he has his own demons to deal with. Their chemistry was heartfelt and raw, which in my opinion is the best kind. Maisey Yates does a stellar job creating these characters and incorporating all of their idiosyncrasies into every moment of the book. From Eli's borderline OCD cleanliness to Sadie's love of her silly cat, it was all woven into a wonderfully told story. I enjoyed the supporting characters as well and I look forward to reading their stories in the future. Small towns tend to have a lot of interesting people and Copper Ridge was no exception. All in all I really enjoyed this and I look forward to more from Yates in the future.